If you have traveled to Paris, you might have come across the concept store Colette located in Rue Saint Honoré. If you are a fashionista, then it is rather probable that you know Colette even if you have never been to Paris. Since 1997, the store with the two blue dots had been a place for “it” products. Fashion, music, electronics, books, iPhone cases, gimmicks, really a bit of everything. And there are regular expositions of contemporary art. Often it seems that products get introduced to the market via Colette. Remember my swimming penguin paper clips, they were from there. For Christmas I received a Colette Surprise. These bags are a fun way of giving a sampling of what Colette had to offer (in terms of gimmicks). Today, I want to share the content of my Colette Surprise. 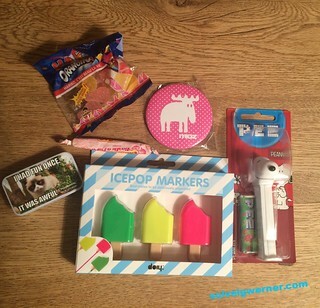 The items that waited for me side were a pink mirror with a moose on it, a Snoopy Pez dispenser, grumpy cat mints, ice pop markers, Haribo Pik! Orangina and a pink cotton candy Caramba. I am wondering if I should open my Snoopy Pez, or if I should keep it, as it might become a collector’s item in a few years (wishful thinking I know…). I absolutely love those markers, they’ll be great for being organised in 2016, I have a sparkling new diary to use them in. I am not a big fan of the Orangina Haribos, but these include a new flavour, grapefruit, which does sound interesting. And proposing mints from my grumpy cat mint box, will always lead to a good laugh. As for the mirror, one can always make use of a mirror somehow, even boys (annoying people with the suns reflection for example). Ok, ok the best item that I found in my surprise bag was a gift certificate from my dad. Do you like receiving or giving surprise bags? What were the contents inside? Have you ever been to Colette? What was your impression? Disclaimer: I have not been in any way asked to write about the Colette Surprise, or about Colette, I am just sharing a Christmas present.